Immune Nations is a touring multidisciplinary, research-based exhibit on public policy, global health and vaccines. A group of researchers and artists is exploring the role art can play in debates around public health policy and vaccination in Immune Nations, an international multidisciplinary exhibit that recently toured Europe. 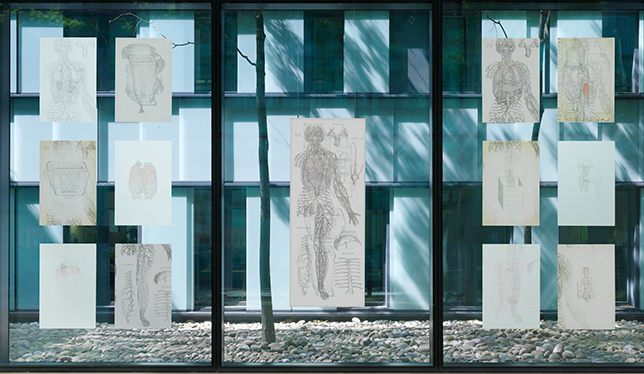 Sean Caulfield’s “Anatomy Table,” a silkscreen and digital print installation, appeared in Immune Nations at the UNAIDS headquarters in Geneva from May 23 to June 30. Immune Nations developed through three workshops from which “collaborations began to form organically between artists, policy experts and scientists,” Dr. Caulfield said. Teams then selected themes and subjects for art projects, and assembled their pieces. Throughout the process, the artists and researchers explored ideas related to vaccines and public policy – including vaccination access gaps between the Global North and South, and the concept of herd immunity – as well as methodologies related to interdisciplinary research and creation. The art pieces, funded by organizations including U of A and the University of Ottawa, were exhibited in Trondheim, Norway, and Geneva, Switzerland this spring. The viewings were tied to international public policy events and “high level public policy experts/stakeholders were present at the opening of both events, most notably the Canadian Health Minister [Jane Philpott] and the First Lady of Namibia [Monica Geingos], as well as numerous UN representatives at the UNAIDS opening [in Geneva],” said Dr. Caulfield. The project team also participated in public lectures at the Global Health and Vaccination Research conference in Norway, with the goal to advance a nuanced and multifaceted dialogue about vaccines.